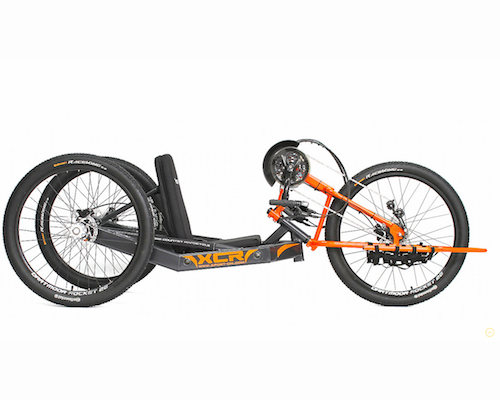 The XCR Cross Country Handcycle is lightweight, fast and equipped with high quality components including disc brakes on all three wheels. The XCR is great for most terrains, meaning forest trails, muddy or sandy roads are now accessible. Change the off road tyres to road tyres and the XCR can now be successfully used to compete in marathons and competitions. The XCR will also be available with it’s own trailer great for carrying an expedition pack, tent, equipment for fishing and your wheelchair, in fact everything you might need to spend some quality time off the beaten track. To enhance your riding experience even further, an electric drive system is offered for the XCR. Thanks specially designed grips, tetraplegics will also enjoy the ride on our handbike.